Choose Combination Below - Wall Mounts - These are brand new units, not refurbished like some of the other online stores sell, Check us out at Better Business Bureau. Buying from trusted source with best customer feedback and warranty is our promise. Below are LG, Mitsubishi, YMGI, Sanyo and Klimaire options. 16 ft of lineset package available with each indoor unit. Auto Restart, Auto Changeover, Dehumidification mode. 25 ft of lineset package available with each indoor unit. 15 ft of lineset package available with each indoor unit. 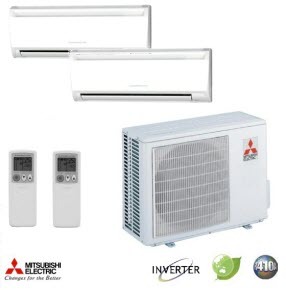 Auto Restart, Auto Changeover, Dehumidification mode, Microprocessor technology, Washable Anti-allergen Filters.. MIX & MATCH COMBINATIONS - SEVERAL BRANDS - Start with YMGI brand, followed by LG and then Mitsubishi Mix and match combinations below. YMGI PRICES BELOW INCLUDE INSTALLATION KIT FOR EACH INDIVIDUAL INDOOR UNIT. You can combine one 9000 btu Wall Mount unit with one 12000 btu Ceiling Mount for example with YMGI or you can combine one standard wall mount 12000 btu unit with one 18000 btu Mirror Panel from LG Or you can combine one Floor Mount unit 12000 btu with one Ceiling Concealed ducte from Mitsubishi. Any Combination is possible now with below sets.